Improve fire protection by maximizing system reliability and performance according to guidelines in the 2011 Spanish NFPA 12. 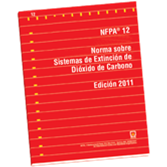 Trust the 2011 Spanish edition of NFPA 12: Standard on Carbon Dioxide Extinguishing Systems for the latest rules for the installation and maintenance of carbon dioxide extinguishing systems. Coverage addresses total flooding systems, local application systems, hand hose line systems, standpipe systems, and mobile supplies. Modified requirement for system operational tests ensures that notification devices are tested. A new definition of "fire watch" was added to correlate with NFPA 1 and to provide clarification to what is meant when fire watch is required. Editorial revisions were made to correct English to Metric unit conversions.